Singer-songwriter (and new mom) Jessica Hernandez is having a pretty good year! Still riding high on the release of her Telephone/Telfono album (“It’s psychedelia surf with Latin roots, plus a definitive, punky edge—not to mention plenty of the renowned Detroit nitty-gritty.” – SLUG magazine), Jessica refuses to be pigeon-holed. Though she has Latin roots, don’t think Shakira…she and the Deltas are R&B soul by way of Detroit. Telephone/Telefono, a duel release recorded in both English and Spanish, was released on Instant Records in 2017 and supported with a tour and appearances on NPR, KEXP, LAST CALL WITH CARSON DALY and more. 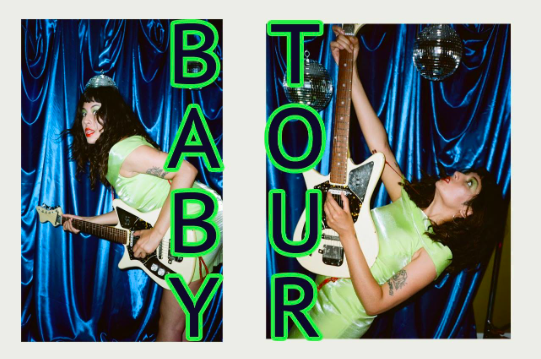 After taking a little time off to have her baby girl, she is back on the road with the Deltas and a handful of August dates (dubbed the BABY TOUR! ): August 11 in San Diego, August 14 in San Francisco, August 16 in Portland, OR and August 17 in Seattle. Visit Jessica’s website to see if she’s coming near you at https://jessicahernandez.net.